The dsp.PhaseUnwrapper System object™ unwraps the phase of the input signal specified in radians. Create the dsp.PhaseUnwrapper object and set its properties. phUnwrap = dsp.PhaseUnwrapper returns a phase unwrapper System object that adds or subtracts appropriate multiples of 2π to each input element to remove phase discontinuities (unwrap). phUnwrap = dsp.PhaseUnwrapper(Name,Value) returns a phase unwrapper System object with each specified property set to the specified value. Set this property to false to unwrap phase discontinuities only within the frame. Set this property to true to also unwrap phase discontinuities between successive frames. Specify the jump size that the phase unwrapper recognizes as a true phase discontinuity. The default is set to π (rather than a smaller value) to avoid altering legitimate signal features. 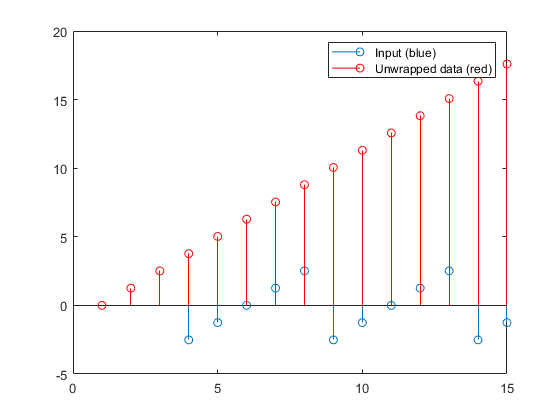 To increase the phase wrapper sensitivity, set the Tolerance property to a value slightly less than π.
output = phUnwrap(input) unwraps the phase of the input signal. This is done by adding or subtracting appropriate multiples of 2π to each input element to remove phase discontinuities (unwrap). Each column of the input signal is treated as a separate channel. Data input, specified as a vector or a matrix. The phase of the input signal should be in radians. This object implements the algorithm, inputs, and outputs described on the Unwrap block reference page. The object properties correspond to the Simulink® block parameters.